According to old ads, chemist used to sell stuff called “film” from a company called “Kodak”. 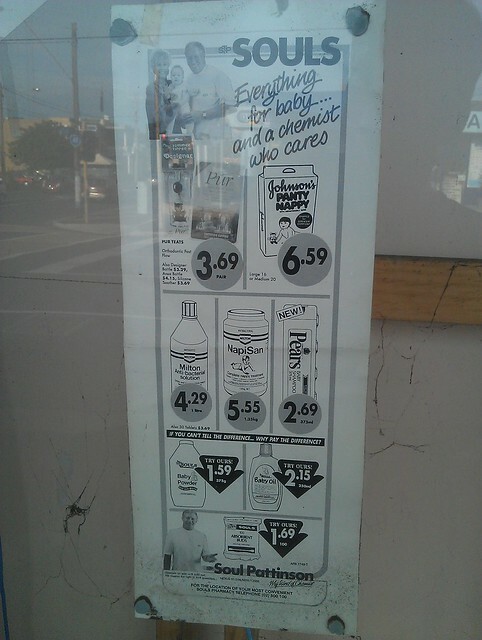 One of the chemists in Bentleigh is renovating, and this old signage has been revealed — soon to be covered up with something new. Apparently they used to sell stuff called “film” from a company called “Kodak”. The windows have also shown up some old ads. Anybody care to estimate how old they might be? Evidently “Beyond 2000” finished in 1999. What is cross linked elastin cream, anyway? The sign on the top of the shop might be a good submission for Our Fading Past. ← Previous Previous post: Feel unsafe on the train? You shouldn’t. I think some photographers still use film. Maybe black-and-white photos come out better with film. Not too sure. Yes, professional photographers, who know what they are doing, use film. The results are better and will last forever. Kodak still makes and sells film, but Fuji is probably more popular among professionals. I assume that is permission. Photo saved. @Andrew, most of my photos are posted on Flickr (from where you can get a higher-resolution version) under a Creative Commons “Attribution-NonCommercial-ShareAlike” licence… in other words, yes, you can take a copy, but if you re-publish you have to attribute it to me, you can’t use it commercially, and you have to use similar conditions when you publish. The ad with prices is from after 1966 because it is in dollars. 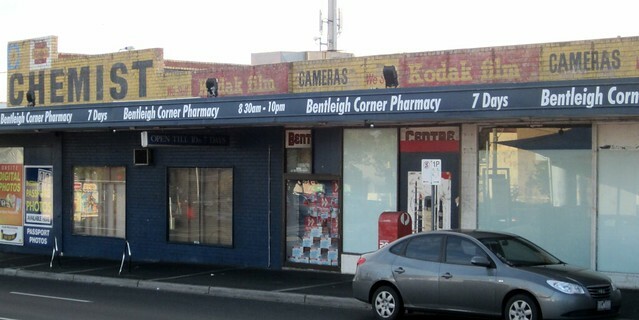 The pharmacy/post office near McKinnon train station has a lot of old Pharmaceutical equipment along the top shelf. My gut feeling for the Soul Pattison ad is 1980s or even ’90s. Measurements appear to be in metric. Prices aren’t outrageously cheap. There are some items (eg chocolates and cheap shampoo) that have changed little in price in 20 years. I can’t quite pick it but there appears to be a phone number at the bottom to find your nearest outlet. IIRC local call 008 numbers started sometime in the 1980s and then became 1800 freecalls in late ’80s / early ’90s. I think mid 1990’s for the napisan ad one. The number “for the location of your most convenient Souls Pharmacy” is actually (02) 500 100. I’ve never seen an 2+6 digit number before (I’ve seen some 3+6 digit numbers for regional areas), so I assume it’s from the 1980s—and probably before 008 numbers, because otherwise a Victorian branch wouldn’t’ve been advertising a Sydney number. Err, ok. Maybe best if you or T post it. The nostalgia has come flooding in! Beyond 2000 was one of my favourite shows as a kid! 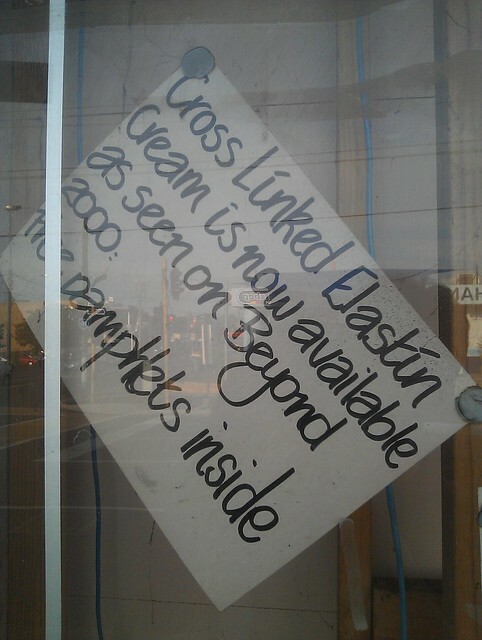 I recall ‘Cross Linked Elastin’ being one of those ‘big breakthrough’ anti-wrinkle creams that came out in the 1990’s. I can recall it being flogged on TV at the time on the likes of Good Morning Australia and so on. @Felix, The 2+8 system we have now for fixed line numbers was rationalised in the early 90s. Prior to that we had a mish-mash of 2+6, 2+7, 3+5 and even 4+5. 008 numbers appeared in the late 80s before they were converted to 1800 around the early 90s. @Philip – Well that will depend entirely on the photographer, what they’re shooting and what they’re trying to achieve. However I’m pretty sure you’ll find the vast majority of professional photographers primarily shoot digital these days. If anything, film is more popular amongst hobbyist photographers. As for better results, once again depends on what you’re doing. Low light candid photography? Film doesn’t even come close to producing the results achievable on some newer DSLRs as a good digital sensor can cope much, much better under extreme lowlight scenarios. Long exposure, landscapes? A nice old medium format camera will produce results as good or better than any digital equivalent. I think that you will find that one reason that New Zealand changed their coins was so they cannot be mistaken them for Australian coins. PaulK, I can remember 008 numbers (like 008 800 933, for Gardening Australia) and I think that would be extremely surprising if it was in the early 90s they were phased out. Surely it must’ve been the mid or late 90s. I guess it depends on your definition of “early 90s”. @Felix, you could well be (and probably are) correct. Such a change is not done overnight. It was started around 1992 and I thought it was all complete by 96, but it could have gone to 97. The older system just grew as and where it was needed, there wasn’t really any overall plan until the 8 digit local number scheme was brought in. So prior to that there was a bit of everything. Many country areas were on local 5 digit numbers with three or four digit area codes, while most of Melbourne and Sydney were on 2+7. And up until the early 80’s there were still a few manual exchanges running on 3 digits.